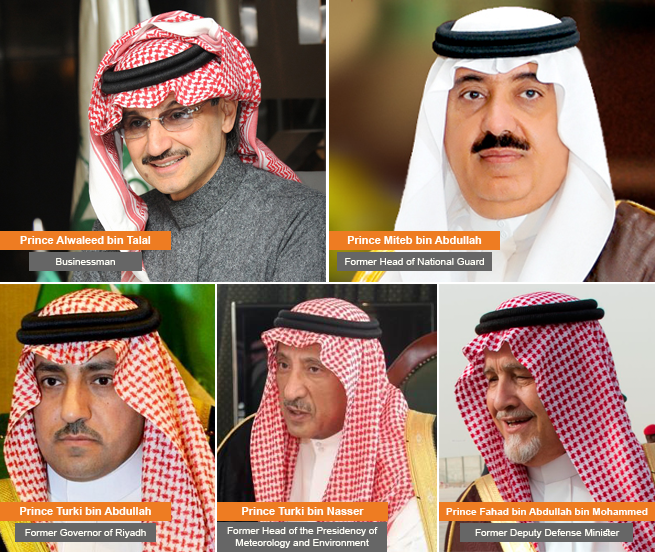 Saudi Arabia has arrested 11 princes including billionaire Prince Alwaleed bin Talal, as well as 38 former and current ministers, in a sweeping crackdown against corruption. Saudi Arabia’s King Salman on Saturday announced a cabinet shakeup, under which Mohammed al-Tuwaijri will replace Adel Fakieh as Saudi Arabia’s Minister of Economy and Planning, and Prince Khalid bin Abdulaziz bin Ayaf will replace Prince Miteb bin Abdullah bin Abdul Aziz as Minister of National Guard. The King has also ordered Lieutenant General Abdullah al-Sultan, commander of the naval forces, to step down. He will be replaced by General Fahad al-Ghufaily.